When it comes to straight-talking about money issues, the initial feeling is usually, “Ouch”. Downsizing one’s plans, shifting into a lower gear, or turning around and going back all feel nasty when money is on the line. When the money is coming in, there seems little need to evaluate one’s decisions. The inflow of cash is almost universally interpreted as validation. But what if you could have been making more? What if you could have been making the same amount, but having done so in such a way that built a sounder financial foundation and infrastructure? We usually don’t give a very thoughtful look at our finances until we run into trouble. It might be too late to respond well by the time the stitching is coming unraveled or the ship has sprung a leak. 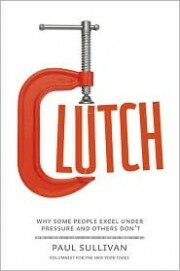 Hence the significance of being “clutch” with one’s money. In this chapter, Sullivan explores stories where people were and were not able to make crucial down-sizing decisions when information began emerging that trouble was in the air. Especially interesting to me is the insight that money decisions are particularly difficult ones with which to reverse course. Of all the difficult and complex decisions we face at work and in life, we have a lot—maybe too much—of ourselves at stake in our financial decisions. It seems that we should be congratulating ourselves for being able to adjust course sooner than later in a tough economy, after an unexpected job loss, or during a complex business crisis. But more common is the feeling of failure, loss or an ego-threatening blemish on our record. And this negative interpretation of a difficult situation leads us to make unwise and often disastrous financial decisions. What about you? Are you able to back off or cut back when reality no longer aligns with your original criteria for a certain financial commitment you’ve made? Does turning around mid-course feel like a failure to you? Try writing down fifteen reasons why if feels that way. Then write down fifteen reasons that making the adjustment is actually a decision-making success. This entry was posted on Wednesday, May 4th, 2011 at 7:35 am	and is filed under Clutch by Paul Sullivan. You can follow any responses to this entry through the RSS 2.0 feed. You can leave a response, or trackback from your own site.